The first Miss Golden Globe title was given out in 1963 to the 26-year-old film actress Eva Six and 30-year-old TV actress Donna Douglas. 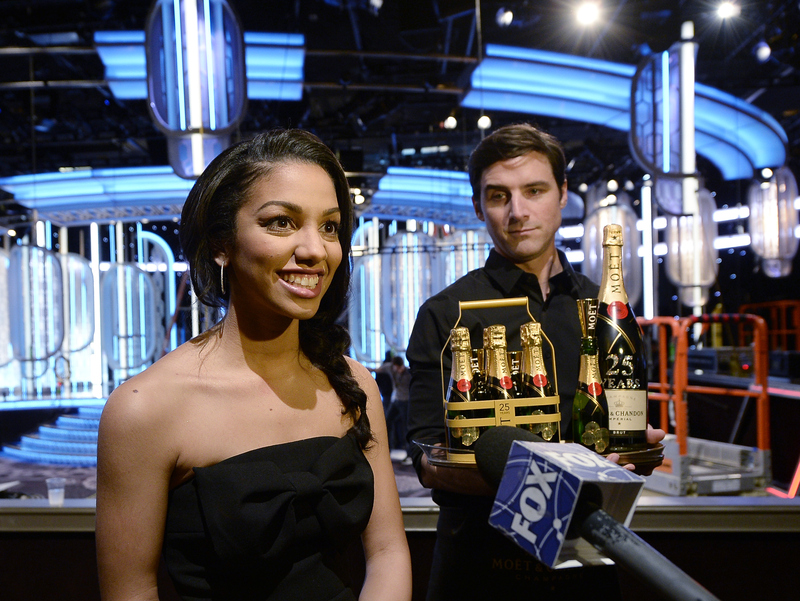 The next Miss Golden Globe title, to be given out on Sunday's 2016 ceremony, will be going to Corinne Foxx, the 21-year-old daughter of actor Jamie Foxx. The tradition, which began in 1962, gives recognition to the daughter or son of the "industry's most respected actors/actresses/directors/producers," as chosen by the Hollywood Foreign Press Association, and the subsequent Miss or Mister Golden Globe "assists during the Golden Globe Awards ceremony." The announcement that Corinne Foxx would be the 2016 Miss Golden Globe prompted the HFPA to look back upon their first African-American Miss Golden Globe (Rosanne Katon, 1981), but that same announcement might have given you some pause. After all, as the article declares, there have only been five black Miss Golden Globes in the title's 54 year history. Diversity of Miss Golden Globe holders over time has been... poor, to say the least. The article prompted me to take a look back at the many, many, many women and men who have won the title since 1962, and that number didn't improve. Of the 48 people who are listed as winners of the title between 1962 and 2016 on the official Golden Globes website, only five of them were black, only two of them were Hispanic (Cuban and Argentinian respectively), and the rest of them were white. None of them were Asian or Indian or, you know, any ethnicity outside of the three I've mentioned. So, in the last 54 years, 41 of the 48 Miss Golden Globe winners were white, which kind of paints a sobering picture of the title, Corinne Foxx or no Corinne Foxx. The website doesn't list by exactly what criteria the HFPA ultimately selects its Miss Golden Globe winners, save that they must be the son or daughter of the industry's most respected figures. The youngest person to ever win the title was Laura Dern in 1982 at age 15, while the oldest thus far was 34-year-old John Clark Gable in 1995, so we can probably safely assume that this son or daughter must be relatively young, or they may be SOL if they haven't already won the title one year. In addition, the Miss Golden Globe information page states that "over the years [the title] has introduced many second and third generation stars; among them: Linda Evans, Anne Archer, Laura Dern, Melanie Griffith and her daughter, Dakota Johnson," so perhaps a likelihood that this son or daughter might, or already has, followed their famous parent into the Hollywood game is a silent requirement for the title? Since that still leaves quite a lot of people of color who could have, or should have, been recipients of the title over the last few years and the future, that's no real indicator as to why the Miss Golden Globe holders is such an monochrome list. North West could break the record for being the youngest person to win the title at 3-years-old. Jaycee Chan, the son of Jackie Chan, has plans to return to the entertainment industry, and would just make the cut off age of 34-years-old if he won the title in 2017. Maya Rudolph, the daughter of a singer-songwriter and a producer, could become the new oldest recipient of the title at 43-years-old, because who says there's necessarily a cutoff age at all? Troian Bellisario, the biracial actress of Pretty Little Liars fame, has parents who are both producers, so she could also be eligible. The list of potential winners is quite literally endless without ever mentioning the name of a white actor, actress, or famous industry child. That's not to say that I am in any way demanding the outright exclusion of white celebrities from the Miss Golden Globe recipients list. It's just that, with a list that is so heavily dominated by them, and no criteria specifying that only they can win the title in nine out of every 10 cases, there's no reason for Corinne Foxx to only be the fifth African-American Miss Golden Globe in 54 years, for there to have only been two Hispanic Miss Golden Globes in 54 years, and for other ethnicities to not be represented on this list at all in the last 54 years. The fact that the HFPA would have to name a different person of color as Miss Golden Globe every year for the next 41 years in order for the list to be equal in minority winners versus white winners should be a wake up call about the title. It should be a call to arms about the title. It should make Corinne Foxx not just one of a handful of people of color on this list, but instead just the one who bore the honor with grace and aplomb in the year that the HFPA decided to make this the time they launch a concentrated effort to incorporate more sons and daughters of color, like her, into the ceremony going forward.